We need to get these men under control. “People shouldn’t jump to conclusions before we have all the facts,” President Obama has said. And there is someone, somewhere, who knows what those facts are. We need that person, those people, to come forward to help us address the social disorder that seems to be getting more and more traction in this country. Mental illness, political extremism, paranoia, the desire for attention, an orientation toward violence that has found a cause—whatever the reasons, mayhem is becoming our daily fare in the media. As President Obama reminds us, we need cool heads to turn this around. Vengeance begets vengeance. If the desire for it trumps the necessary groundwork, one can also end up on the wrong side of justice. September 11 is an ever-present reminder, but I have a pertinent, personal experience with the issue of justice. In fact, I am just days away from an important anniversary. Last April I was selected to serve as a juror in the death penalty trial of Michael Astorga. He had been convicted by another jury of murdering a deputy on duty, and we were to decide whether he would be put to death. It was a wrenching experience, and when we reviewed the evidence presented in the previous trial, I got a good look at how easy it is to lose control over responsibility when you are angry. In this case, it was law enforcement officers at fault—not all, but some. The murdered deputy had been a very attractive, very dedicated, very well liked young man, and his fellows were enraged by his murder. He was shot in the face at close range, presumably during a traffic stop; and the sight of his body on the highway, which we saw again and again, was enough to drive anyone berserk. But you have to do the work. Evidence must be meticulously and immediately collected and properly preserved. You cannot intimidate compromised individuals into making statements that can’t be trusted. You cannot use a search warrant as a “search and trash” warrant. And all of you have to be able to look jury members in the eye when testifying. To be brief, the evidence was sufficient to ensure that Michael Astorga was convicted, but it did not mobilize the death penalty. He will be in prison for the rest of his life, and the outcome was unsatisfying for everyone involved. That’s what happens when those in charge of finding out the truth don’t do a good job. And I think we need a new movement at the grass roots in this country that is a commitment to doing the right thing and keeping the peace. The individual paragon would be a cross between a whistleblower and a vigilante, and I can’t help but think that this individual would often be a woman. We all have eyes in the back of our heads where our men are concerned, but one unfortunate result of the way things are is that this awareness doesn’t come with power. Too many of us don’t feel that we have the right, the responsibility, or the standing to interfere with what the males in our lives are doing. This could involve crime, general aggression, physical or sexual abuse in the home, or something as minor as a teenager’s graffiti adventures at night. If we like mayhem and chaos, there will be more. If not, things need to change—among us, the women. So as I said, somebody out there knows of a suspect for this act of violence. Somebody has noticed odd purchases, odd behavior, incriminating talk, unusual reaction to media coverage, a change in routine or movement. And it might very well be a woman who now realizes that she has observed evidence of a horrifying plot. The bottom line is that we need to get these men under control. Look at the news about Syria and Iraq. Violence can become a way of life, with daily bombings and men running around in the streets with assault rifles, buildings crumbling, women and children dying, blood everywhere. Not here? That would be naïve. 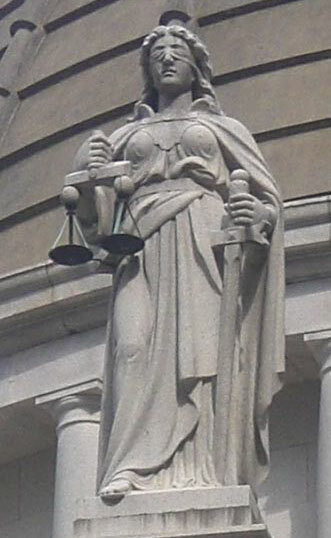 and what of Lady Justice so often shown wearing a blind fold…….might this enhance the eye’s in the back of the head, the indirect yet accurate sensing of what is really going on? Like it, Elizabeth. Let’s work with this.